Why Would I want to Live in…….. Cathedral City? Cathedral City is a mix of many things. There is a little of everything and more affordable prices than the neighbor to the West, Palm Springs. Even if you live in Palm Springs you’ll probably do a fair amount of shopping in Cathedral City. There are simply more stores, auto dealers, home improvement outlets and the gas is cheaper and easier to find. In the housing sector, you will find a mix of condos and houses – at very good prices – as well as a handful of golf courses. There is some lease land in Cathedral City but a lot less than in Palm Springs. Two of the largest developments on leased land are Cathedral Canyon Country Club and Desert Princess. Cathedral City History: Is actually named after a Canyon South of the actual town, in fact, there is no Cathedral in Cathedral City at all. Just South of 111 near downtown there is St Louis Catholic Church. The dramatic spire/steeple on the roof was said to be donated by Frank Sinatra’s’ mother Dolly who attended the church when she lived in the Desert. Legend has it that the city was once a gangster hideaway and there were illegal gambling halls and saloons sprinkled throughout the area. Today Cathedral City has a year-round population of about 50,000 people. Home to the Mary Pickford Theatre, many auto dealerships, a Downtown undergoing a makeover, A multi-purpose sports facility called Field Of Dreams plus many quiet neighborhoods and country clubs. Interesting Cathedral City Facts: The neighborhood of Minerva Drive has an annual Christmas time light event every December since the first event held in 1987. The homeowners heavily decorate the block’s 35 homes and lawns, and streetlights are even covered in holiday decor draws in tens of thousands of spectators to Minerva Drive for a look. It is often renamed, Candy Cane Lane. The Independence Day festival on every third weekend of September also has an “El Grito de Dolores” to commemorate the event at the city hall/movie theater complex. The city also, has an economic partnership with the Mexican state of Jalisco, a large source of local immigration. Chicano folk musician, Lalo Guerrero lived in Cathedral City in his final years. Also, the city was the teenage home of actress Suzanne Somers, and a winter residence for actors Robert Duvall and Martin Landau in the 1960s, and TV show host Monty Hall in the 1990s. Also US representative and football athlete Jack Kemp owned an auto dealership in Cathedral City. 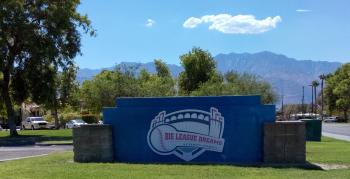 The Field of Dreams softball complex on the corner of Date Palm and Dinah Shore drives, made up of four softball fields designed as replicas of four major league ballparks. The Pepsi All-Star Softball Game was held there since 1998. Cathedral City High School opened in 1991 is a major educational and recreational center to the city. The varsity football and basketball teams had earned CIF-southern California championship runs in the late 1990s and early 2000s. In the 2000s much of the central core of the town along highway 111 was torn down. There were big plans to build it out and even included, at one point a Sheraton Resort Hotel, but the downturn in the economy in 2007 nixed many of those plans. Today there are some buildings such as City Hall and the soon to open community theater as well as a few shops but there is still more vacant land along highway 111. Exciting new plans are in the works to finish out some of these spaces. Included is an outdoor amphitheater complex. Trader Joes – Fun Shopping – great prices – Unique Prices! La Casita – Great Mexican Food!